Southern and Southwestern China are two large and exceptionally diverse regions, both in population, weather, and culture. Many of China's largest cities are included in this classification, including Guangzhou, Chengdu, and Xiamen. In general, China's southern provinces are wetter with warmer temperatures than northern neighbors. Winter, which runs from January through March, is short but typically very cold, while April through September is the rainy season when temperatures and humidity peak. Along the southeastern coast, in Fujian and Guangdong, typhoon season lasts from July through September. Autumn is the best time to visit Southern China because of the mild climate and break in humidity. Winter can also be beautiful in the far south as it will not be frigid for long and you can enjoy outdoor activities. 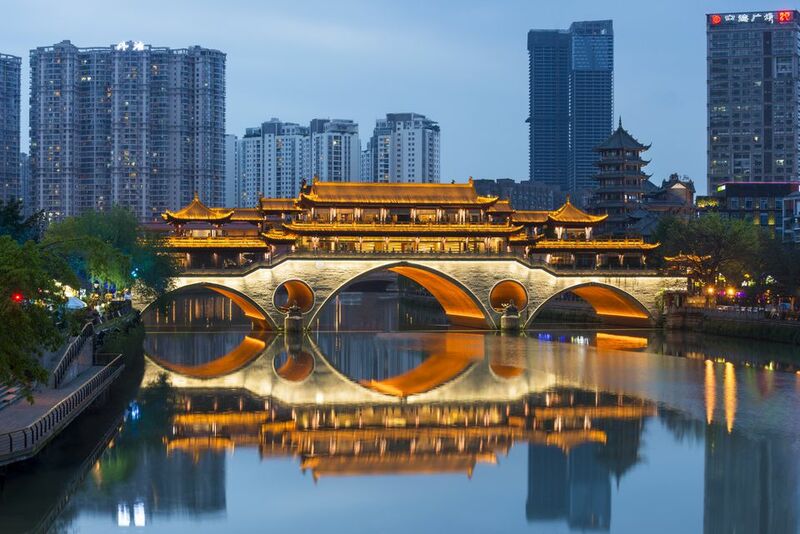 Chengdu is generally cool and humid year-round. The city has four distinct seasons, which include a warm spring, a long summer that can sometimes be quite hot, a wet fall, and winter that is cold and prone to fog. Temperatures average 86 degrees Fahrenheit (30 degrees Celsius) in July to 48 degrees Fahrenheit (9 degrees Celsius) in January. Guangzhou is the largest city in China's Pearl River Delta. The subtropical climate means that the city experiences hot summers and balmy winters with little to no frost or snow. While fall is typically the best time to visit, Guangzhou's average temperature ranges from 70 degrees Fahrenheit (21 degrees Celsius) to 84 degrees Fahrenheit (29 degrees Celsius), so it can be a beautiful destination year-round. May is the wettest month, receiving nearly 11 inches of rain on average. Not unlike Chengdu, Guilin experiences a mild climate with four seasons. Spring is usually sunny and warm, whereas summer can be rainy and foggy, as the monsoon season moves in. Winter is chilly, but not freezing, with occasional periods of rain. On average, the temperature in January is 46 degrees Fahrenheit (8 degrees Celsius), and 82 degrees Fahrenheit (28 degrees Celsius) in July, the warmest month. Kunming, in China's Yunnan Province, has a pleasant, consistent temperature year-round. The spring-like climate averages 59 degrees Fahrenheit (15 degrees Celsius) year-round, peaking in the high 60s during the summer months and mid-40s during the winter. July and August are the rainiest months, receiving around eight inches of rainfall. The island of Hainan is China's southernmost province. It has an almost tropical climate, with muggy, hot summers that are also extremely rainy. Spring is pleasant and dry. Winters are mild, with temperatures averaging 68 degrees Fahrenheit (20 degrees Celsius) even in January. Xiamen has a consistently mild and pleasant climate year-round. Even in the coldest months of January and February, temperatures rarely drop below 50 degrees Fahrenheit (10 degrees Celsius). October through January are the driest months; rainfall peaks in August when the city receives approximately eight inches of precipitation on average. Spring can be a great time to visit southern China. Many parts of the region are still dry, as monsoon season hasn't begun yet, and temperatures are generally pleasant. You'll find good weather wherever you go, and much of spring is an off-peak time which means it's also easier to find good deals on accommodations and tours. What to pack: What to pack largely depends on where you visit. Some regions will still experience cooler temperatures into spring, whereas other cities will begin warming up later on in the season. Either way, you'll want to bring along breathable layers that can be removed (or added on) as temperatures warm up or drop. The summer months are peak travel season in China, but in the southern part of the country, they can be quite miserable. While some cities, like Kunming, never get too hot, others are warm and extremely muggy during the summer. The humidity in many parts can be unbearable and excessive rain is part of everyday life. If you must visit during the summer, Hainan isn't a bad idea—at least you can hit the beach if it gets too warm. What to pack: If you are traveling to the region in the rainy season, you will want decent rain gear as it will be common to see rain for several days in a row during this time. During the rainy season, it can easily rain every day, all day long. Dreary? Yes, especially if you haven't anything dry to put on! If you are traveling for business, bring a good lightweight raincoat and a pair of shoes to wear in the rain. If you are visiting as a tourist, then you will want to have a functional, lightweight raincoat, several pairs of shoes to interchange when one pair gets wet and enough layers to let things dry. Fall in southern China is a beautiful season. Temperatures are cooler, and summer's rain has moved on until next year. You might experience more massive crowds in early October due to Chinese holidays, but in general, this an excellent time to visit for good weather and beautiful fall colors. What to pack: As temperatures fall, don't forget to pack sweaters, jackets, jeans, and other cozy clothing. Even though it's the southern part of the country, many cities get chilly, especially at night. Winter in Southern China is much more bearable than northern cities, where temperatures often fall below freezing. While you won't experience that in this part of the country, it can get chilly and drizzly in some cities. This is a great time of year to visit some of the more mild areas in southern China, such as Hainan and Yunnan. Temperatures here are still relatively balmy and most days are clear. What to pack: Layering is essential for the cold and rainy seasons in South and Southwest China. While temperatures during winter will not drop below freezing, it will feel cold because homes and buildings are not winterized. Insulation is not used for construction, and often the window frames are not very tights so cold air flows in. Chinese people are used to merely adding another layer of clothing to keep themselves warm.